If you like sitting on the beach thinking about One Particular Harbor or you are just A Pirate Looks (ing) At 40 and want your own permanent Margaritaville, the new Jimmy Buffett inspired Minto development in Daytona Beach may be just the place for you. The development is Latitude Margaritaville, a planned 7,000 home community with a distinct Jimmy Buffet island vibe. You can read more about the development on the community website or keep reading. While my company, Atlanta Real Estate Brokers, is not licensed in Florida, we offer free Buyers Agent* services for folks trying to understand how to buy a new construction home in Atlanta. (Contact us anytime if you have questions.) 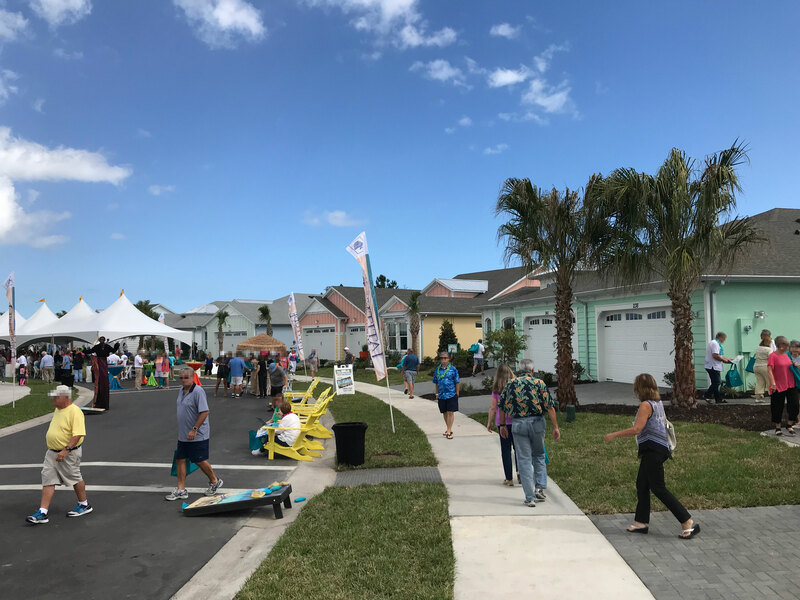 But if you are a parrot-head or a parrot-head wanna-be, and are interested in new construction in Florida, I want to share a first hand account of what this new development offers. First off, Minto knows how to throw a party. Their recent Grand Opening was a street party complete with heavy Hors d'oeuvres, a band and plenty of chairs in the sun. Around the party were nine completed Latitude Margaritaville homes ranging from 1503 square feet to 2564 Square feet. The floorplans vary widely but all are single level homes. My favorites are the homes in the "Island Collection" with their open floor plans but all of the homes are well designed with a light, bright, airy feel. The Island Collection includes some of the largest homes but other collections include many of the same features on a smaller scale. The development is clearly in its early stages but you can already see the vision coming together. The color choices, along with subtle exterior design touches, provide an island feel. The development will include many lakes providing plenty of opportunity to own that waterfront home you always wanted. And street names like "Coral Reef Way" and "Island Breeze Avenue" will definitely convey to your Christmas card list that you have experienced Changes in Latitudes, Changes in Attitudes. Planned amenities include a private beach pavilion on Flagler beach and a central business/entertainment area which will offer retail, shopping and dining. It sounds like you will be able to enjoy a Cheeseburger in Paradise! The area will also include a band stage where you will undoubtedly see plenty of landsharks singing "Fins". Based on what I saw during my brief tour, the place feels right for folks that feel like they are Growing Older But Not Up. This development may be just the place for all you Son of a Son of A Sailors to call home. Feel free to send me a note using our contact form or give me a call on 678-647-7700 if I can offer any advice. Again, we are not licensed in Florida but would be happy to give you advice on what to look for in buying new construction homes in Atlanta or anywhere else. *Our services are paid for by the Seller in the form of a commission.